The 1980s were years of great development of Ghanaian drama because of the performance style which started to be employed by numerous local playwrights. It was also a period during which Ghana Dance Ensemble was born presenting the Ghanaian population with dance dramas that included mime, dance movements, music, song, and theatrical elements like costume, make-up, and special effects. Story lines influenced by Ghanaian artistic forms were interspersed and translated to contemporary stage. Nowadays numerous theatre groups when writing their scripts employ the resources of oral and written performance literature, incorporating poetry, dramatic effects and dance, which helps them to present contemporary realities (Salm 2002:72). Drama, however, is not only popular on stage since it won its recognition among Ghanaian actors and TV viewers, the latter enjoying drama shows featured by a popular TV show, ‘TV Theatre’. The programme uses scripts written by best Ghanaian writers and stars graduates of the Legon School of Performing Arts. 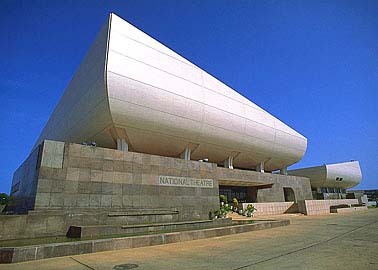 An impressive building of the national theatre of Ghana was erected in the early 1990s on the original site of Sutherland’s Ghana Drama Studio . It is a place of musical, literary and oratory events, with a large impressive stage and several thousand seats (ibid 2002:72).